For the last 10 years or so I've been fortunate enough to go on a family holiday somewhere sunny every Summer, and I'm so grateful for that, but in 2012 we had our last one (my sister and I are both adults now so it was time to bring an end to that era), and boy was it a good'un. 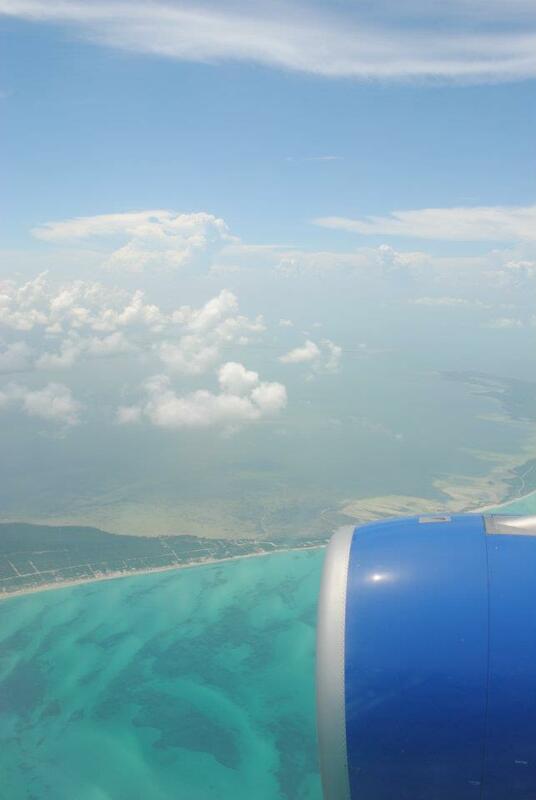 When my Dad told me we were going to Mexico, I didn't know what to expect. It wasn't somewhere I had never really thought about and I certainly didn't know much, if anything, about it, but I was excited nonetheless, especially since I had recently finished studying Spanish at GCSE and staying in Mexico would give me plenty of opportunities to practice my skills. Having been on study leave for a few weeks, I was already feeling pretty laid back and I was all too ready to jet off and spend the next two weeks eating delicious Mexican food, exploring ruins, swimming in cenotes and taking in the beautiful scenery that Mexico has to offer, and it definitely didn't disappoint. The flight to Mexico takes about 10 hours from England (I believe we flew from Luton to Cancun), and buses and taxis are available to take you to your ultimate destination (we traveled to our hotel near Tulum by coach, which took about two hours as it stopped at various hotels along the way). The weather was gloriously hot and the sun was shining fiercely over what we could see through then windows of the coach; plush green jungle, terracotta coloured desert, shanty towns with bright clothing hanging on washing lines outside and quirky little shops with faded signs and tin roofs. 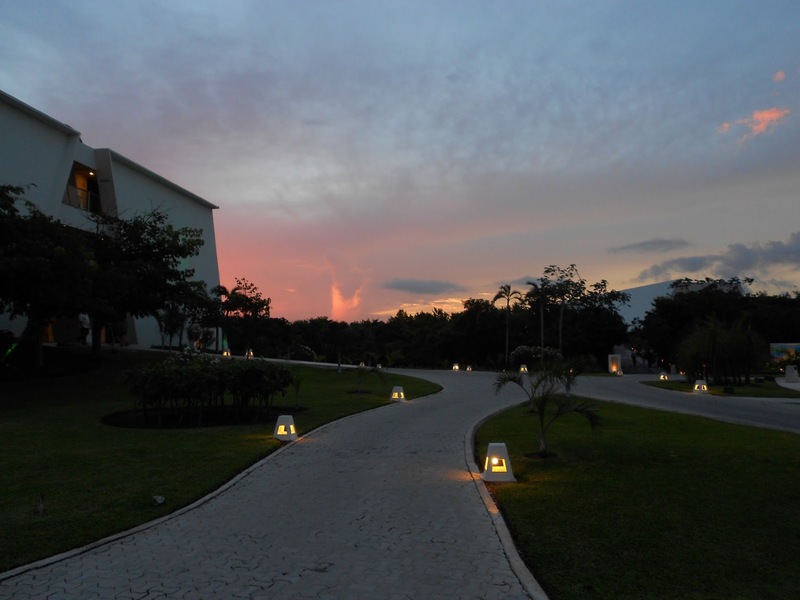 We stayed at the all-inclusive Grand Sirenis Riviera Maya hotel, and I would most definitely recommend this hotel to anyone looking for somewhere a little more luxurious to stay. With its open-air reception, marble floors (which provide a safe haven for your feet after walking around on hot sand) and its striking architecture, this hotel really is a feast for the eyes. There is plenty of greenery on the site too which contrasts beautifully with the crisp white buildings. There are also two pools, one of which has a bar, a lay river and a private beach. And the beach? Oh my goodness - soft white sand, crystal clear waters, and a beach bar which serves drinks (soft and alcoholic) and fresh food. 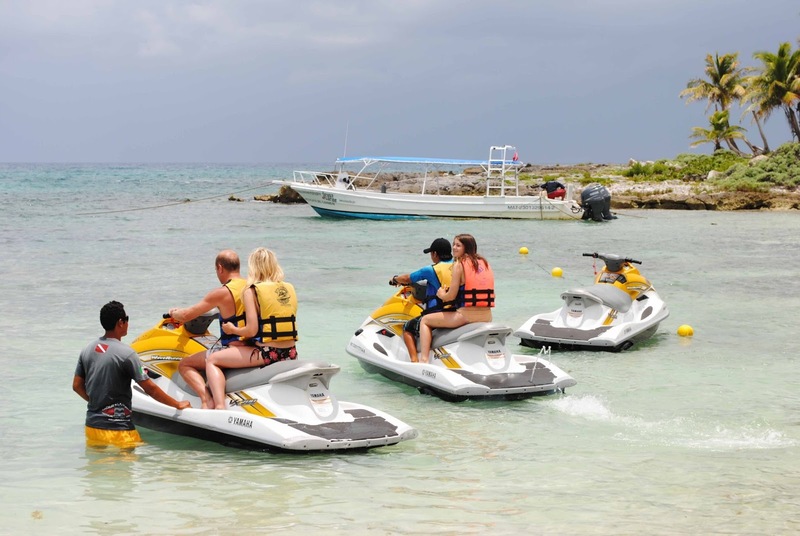 There are also regular events on the beach: barbecues, bikini competitions, salsa classes, jet-skiing, and even lessons on how to make authentic Mexican guacamole. Mexico is famous for its Mayan ruins and there was a little ruin right by the beach at the Grand Sirenis, and although you can't see it in the photograph, there was a footpath up to it, so of course we went for a little explore one evening. 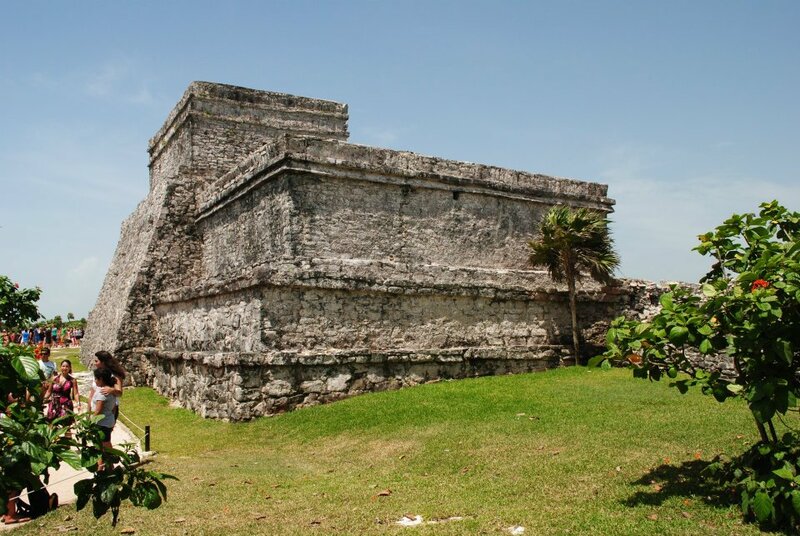 We went on several excursions while we were in Mexico, the first being a trip to Tulum, a Mayan city which was built as a sea port for the trading of turquoise and jade in the thirteenth century. This ancient site is home to Mayan ruins and a picture perfect beach, making it a dream for photographers, historians and sun-worshippers alike. The sun was intense here, so if you ever visit the site I would suggest loading up on the sun cream and making sure to keep your head and shoulders covered. While you can't go inside the ruins, you can still get quite close and they are an amazing sight to see. 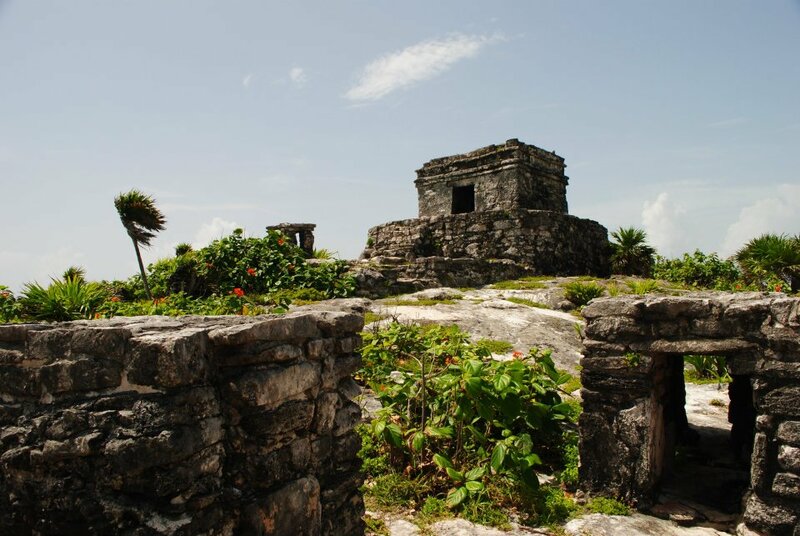 The site is quite large, but there are plenty of friendly tour-guides on hand who are more than happy to tell you all about the history of Tulum and its ruins, although you can make your own way around the site, too. We also spent a day at the beach at Akumal, which is just over an hour South of Cancun and only about a mile along the coast from where we were staying, so it didn't take us long to get there at all (we took a taxi from the hotel). 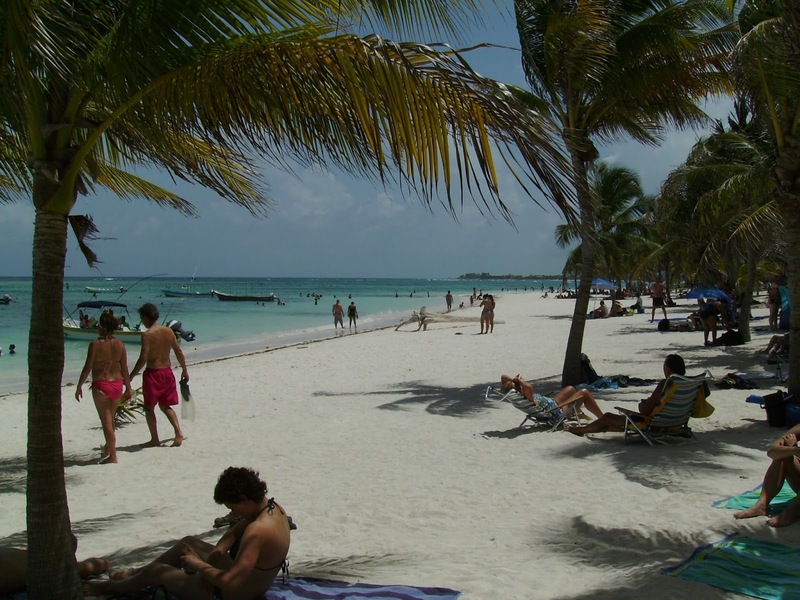 Akumal looks like your typical holiday beach; soft white sand, palm trees, clear skies, crystal clear waters in the most beautiful shade of turquoise, surfers, life guards and of course, sunbathers. There are also a couple of shops and cafés by the beach so you can pick up a couple of souvenir bracelets and have something to eat to fuel you up for a a day of sun-lounging and swimming. However, we didn't come to Akumal just for the beach, oh no. Akumal is also known as 'place of the turtles' because sea turtles are particularly drawn to Akumal, and if you venture out into the water a little during the summer months, chances are you'll be able to swim with them. Since I've loved turtles for a long time now (I have Finding Nemo to thank for that one), this was a very exciting day out for me. My family and I rarely turn down the chance to do a bit of snorkelling on holiday, so we have our own sets of snorkelling gear (which weren't expensive as we picked them up in places like Tesco during the post-summer sales), so after settling down and finding a suitable spot for our towels, we headed out, fins and all, to spot some turtles. It didn't take long for some to come along, and the experience was so much better than I could have imagined. We saw one or two turtles pass underneath us, and just as we were about to head out and dry off, another one came along and came really close to us. He was big (just like the turtles in Finding Nemo) and had two fish accompanying him, and he seemed perfectly happy for us to tag along. Of course we kept our distance, but I was pleasantly surprised at how close he came to us, and we spent a good amount of time with him. 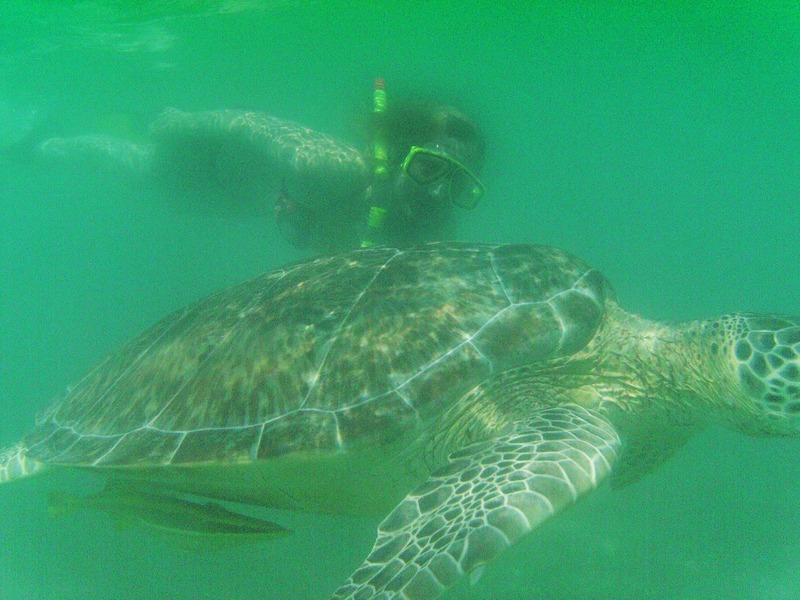 I'd never imagined that I'd be able to swim with turtles, let alone for free and in their natural environment. Much as I loved each and every one of my experiences in Mexico, I do have a favourite. It was the one thing I had been looking forward to the most before the trip, and it turned out I had every reason to be so excited. 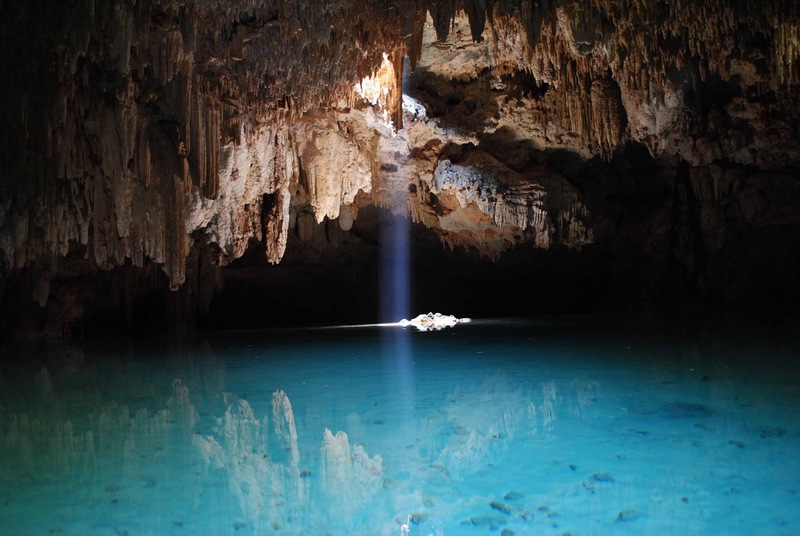 One of Mexico's most famous attractions is its cenotes; natural pools filled with pure water that were used by the Mayans for sacred rituals in the past, but now serve as truly magical places for people to swim and relax in. One of the most famous is at Chichén-Itzá, and originally I thought this was the cenote we were going to visit, but after a bit of research we found one closer to our hotel and decided to go there instead, and I am so glad we did. While Chichén-Itzá looks incredible and I wouldn't pass up the chance to see it, it is a lot more well known than the one we visited so it would have been much busier. The site we visited was the LabnaHa Ecopark. It was a little tricky to find at first because the first couple of taxi drivers we spoke to didn't know where the park was, but, third time lucky, the third driver we spoke to knew how to get there. We were dropped off outside the reception area, which felt less like a reception and more like a treehouse with its straw roof, natural wooden frame and open, airy layout. We were welcomed by the lovely owners/managers Pep and Sergio, who booked us in for a tour of the park and told us a little more about it while we waited for our guide to come and pick us up. 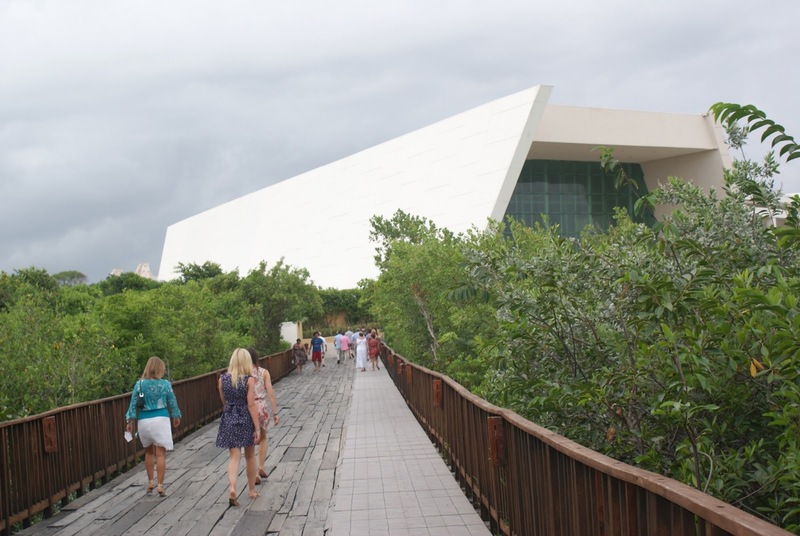 The park offers a variety of activities such as kayaking, zip-lining, swimming in the LabnaHa cenote and cave diving or snorkelling (the cave system was found and explored by Pep and Sergio themselves, who between them have years of diving experience). We were lucky enough to be the only group on the site until we reached the caves, but even then we were only joined by a lovely young couple. Although it won't necessarily always be this quiet, Sergio and Pep only accept around twenty visitors a day so as to keep the park quiet and peaceful and to avoid damage to the ecosystems that exist there. Our guide arrived in a 4x4 and drove us away from the reception area and into the Mexican jungle. Once we had parked up and taken our things from the car, we began our walk into the undergrowth for our first activity; zip-lining. The jungle was so plush and green, and as we walked along the dirt path our guide told us all about the wildlife that lives there - snakes, birds, creepy crawlies, even jaguars. There were two zip-lines to cross, both of which passed over an enormous green lake which is said to be sacred. Now, any zip-line I've been before has been relatively small and made up of a thick wire, some sort of harness and chunky metal clasps which attach the harness to the wire, and you go slow enough that you'll come to a stop as you reach the end. These zip-wires were much bigger than any I had seen before, and although the wire, harness and clasps all looked relatively familiar, there was one part I was not so familiar with - rather than slowly grinding to a halt, we would be using thick, dry sticks to create friction against the wire and stop ourselves. 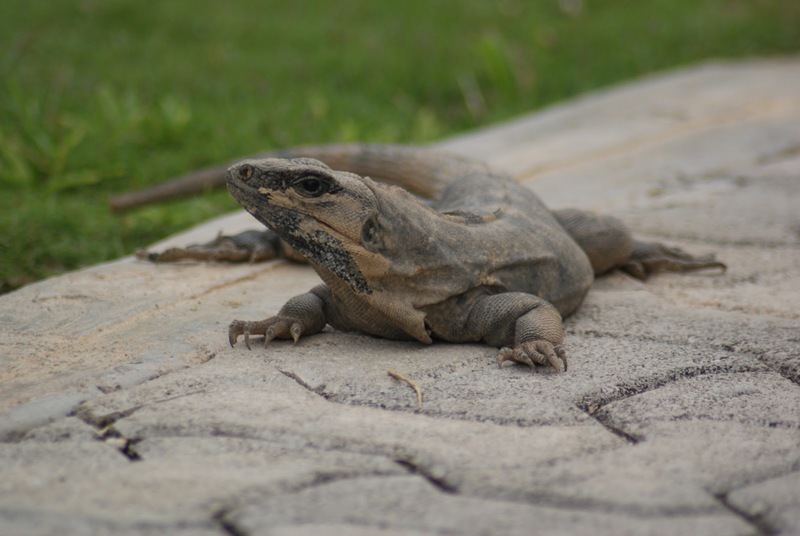 There was something quite primal about it, and it definitely increased the adrenaline boost! After the excitement of the zip-wire, we took a leisurely paddle around the lake in kayaks. The kayaks were only big enough for two people, so my sister and I shared one. If you've ever kayaked with someone before, you'll know that communication is key to stop yourselves going off-course or bumping into things. Let's just say it wasn't our strong point, and we did end up stuck against tree stumps once or twice. None the less, it was so lovely to explore by ourselves for a bit and take in our thriving verdant surroundings. We met our guide on the other side of the lake and headed further into the jungle to find the cenote. After a little bit of walking, the thick woodland opened out into a clearing where we found some wooden huts to change in. 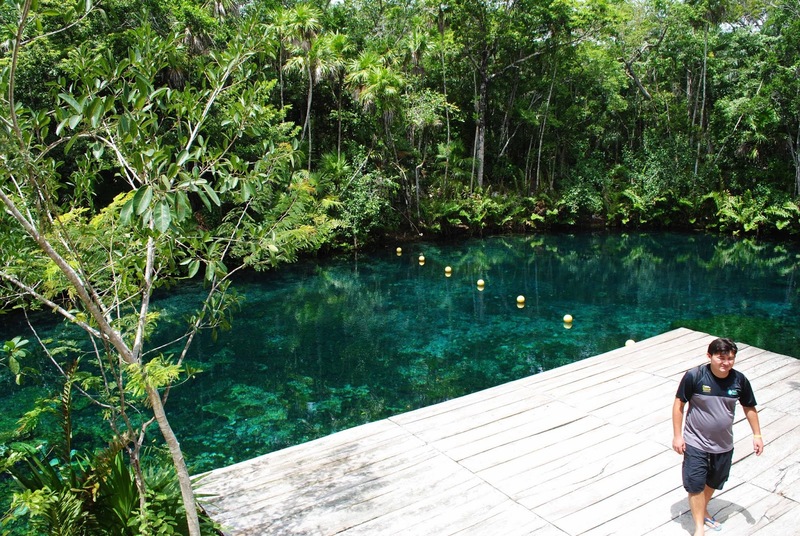 Just around the corner from these huts was a rocky area surrounded by trees, and there it was, the cenote. A bright turquoise pool of crystal clear water, surrounded by an abundance of ferns and trees with a faded wooden platform on the side. All we could hear was the sound of the jungle - chirping crickets, singing birds, our own footsteps - no car engines or noisy planes or phones ringing. It was paradise. The water was so cool and refreshing in the humid midday heat, and as the water is naturally filtered by the rocks it was fresh and even good to drink, although the water right at the bottom (a good few meters down) was salty, but we didn't go that far down. There was a set of steps carved into the rock on one side of the cenote which led up to a ledge a couple of meters above the water, perfect for jumping/diving off, which of course, we obliged to do! After spending some time bathing in the cenote, we dried off and went back to the reception area (where we joined up with that lovely couple I mentioned earlier) to refuel on some fresh fruit and pick up some snorkelling gear before heading back to the car with our guide and driving even further into the jungle. This path was quite a bit bumpier than the last, and we drove for longer than we had before, passing dense woodland, large puddles and streams in the road and communities living in the jungle. Eventually we came to a stop in a round clearing where there was another community living. There were shelters that served as changing rooms and toilets, and just beyond that there was a round, sun-beaten, wooden floor in a rocky patch on the dry, dirt floor. Once we'd stripped down to our swimwear and put on our life jackets, we climbed through that door and down a wooden ladder into a cavern beneath the ground. It was quite dark, with the only sources of light being the hole we had just come through and a hole in the centre of the cavern, but even then it was breathtaking - sandy-coloured stalagmites and stalactites all around us, a beam of light illuminating the centre of the pure turquoise pool in front of us, and through the water we could see soft white sand. The corners of the cavern were pitch black, but this is where we were heading - the entrance to the cave system was in the back left corner. Once we'd taken some time to take in our stunning surroundings and paddle in the cool water, we grouped together and headed into the darkness. Although we had some snorkelling gear such as masks and life jackets, we didn't have any fins or snorkels as using them could damage the delicate rock formations inside the caves. So, with that we paddled out and followed the light from our guide's torch. How they navigated the system is beyond me - with every turn we took it felt like we were heading deeper and deeper into it, entering new caves and taking a different route out. The caves were stunning. We saw some incredible stalagmites and stalactites which were much paler than the ones we had seen when we arrived. They had formed over many many years as mineral-rich water dripped from the ceiling, which gave the formations a dripping candle-like effect. In some places the water was still dripping, and in between the guide's and our own comments this was all that could be heard. It was an incredible experience to explore a cave system by swimming through it, and I'd never seen caves so dark and quiet before. It was challenging at times with tight gaps to squeeze through (made slightly more difficult by the life jackets), but it was a fascinating experience nonetheless. The cave exploration rounded off our day at LabnaHa, so we went back to reception to give back the snorkelling gear and thank Pep and Sergio for the experience. 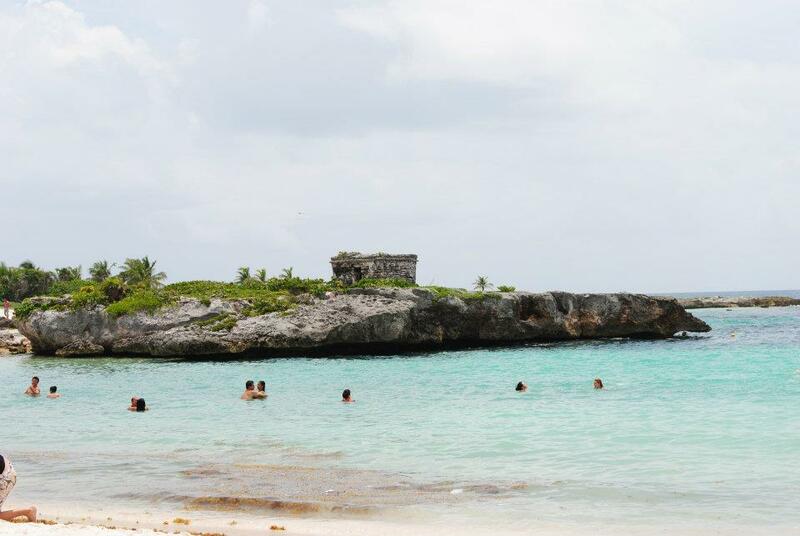 LabnaHa is rated on TripAdvisor as the #1 attraction in Tulum, and I can completely understand why. It combines so many wonderful experiences and places, and it's truly unique. This will always be one of my fondest memories and LabnaHa will always be one of the most beautiful places I've been to. If you're ever in Mexico, even if you're staying closer to Cancun than Tulum, I would still recommend making the journey to LabnaHa. You could easily spend an entire day there (there is even a kitchen on site, so you can eat dinner there), and it would be so worth the journey and the money. I know this post is quite (well, very) lengthy, but there was so much to talk about and I wanted to do it all justice, so thank you if you're still reading! I hope this post has inspired you to go out and see some beautiful natural sights, even if it's something much closer to home than Mexico.